There are many different types of furniture which make use of a range of different fabric and upholstery finishes. Each of these types of furniture requires a different cleaning approach in order to achieve quality results without damaging the fine fabrics and upholstery finishes. Conventional cleaning and washing for furniture pieces is not recommended because the chances of damaging the fabric are too high, not to mention the low success rate of homemade cleaning solutions and attempts. If you want top level furniture and upholstery cleaning, carried out in the comfort of your own home, by highly skilled professionals, properly equipped and ready for the job, then look no further and book your furniture cleaning service right here with us. We guarantee to send you a team of well-trained, experienced cleaning technicians which will review the items to be cleaned, assess the damage and the soiling of the fabric and decide upon the most effective and sparing method to clean the furniture pieces. There is no single cleaning process which can take care of all types of furniture so our cleaners may combine a number of methods in order to yield the best possible results for your particular type of furniture. Special considerations such as color fastness and dimensional stability of the fabric are also taken into account by our cleaning technicians. 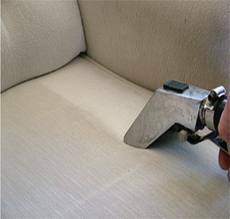 The cleaning techniques and methods applied by our crews are gentle and sparing on the furniture, they will not cause damage to any parts of it whether wood, metal or plastic, or the upholstery of course. Whatever the cleaning system selected by our people, customers can be sure that no toxic chemicals or materials will be used as the health and safety of our customers is paramount to us. There will be no nasty smells, fumes or residue of any kind on any of the furniture or the room in general. The furniture pieces should be ready to use in a matter of hours after the cleaning is done, though this depends on the humidity and ambient temperature of the premises. There are many different types of furniture, each type makes use of different fabric or material finishes, which in turn require a unique cleaning and maintenance approach. The main concern when cleaning furniture the conventional way is the potential of causing damage to the fabrics or the rest of the furniture piece as some of the cleaning materials available in stores are quite aggressive and cause more damage than good. If you are unsure how to go about cleaning your particular type of furniture it is best to call in for some professional help and save yourself the cleaning woes. We can offer you want top level furniture and upholstery cleaning, carried out in the comfort of your own home, by highly skilled professionals, properly equipped and ready for the job. Customers can be sure their valuable furniture pieces are in good hands as our expert cleaning technicians will review and asses the type of furniture, the staining and damage it has sustained and based on these will determine the most appropriate and effective cleaning method in order to achieve top results with no risk of damage. There is no single method used to clean all types of furniture as they vary greatly in type, material and finish so our technicians will use a number of cleaning techniques or systems in order to deliver professional grade results, quickly and with no risk of damage. Special considerations such as colour fastness and dimensional stability of the fabric are also taken into account by our cleaning technicians prior to selecting the suitable cleaning technique and its application. The cleaning systems used by our crews are designed to work only on the fabric and will not have any effect on the rest of the furniture piece either metal or wood. The cleaning materials and equipment are non-toxic and pose no health risk to humans or animals, there will be no chemical residue or nasty smells lingering in the room after the cleaning session. The furniture should be dry and ready to use after a few hours, again this depends on temperature and humidity. People who know a thing or two about quality furniture will appreciate the beauty and value of a good furniture piece or a furniture set. Some of these pieces are priceless antiques with no equivalent, others are pricy custom made designer pieces or just your favourite couch. Regardless of which is your top choice of furniture, you probably know the importance of proper cleaning care and maintenance of such valuable home features. There are different types of furniture fabric and material finishes and upholsteries which require a gentle cleaning approach and professional expertise. Don’t risk the good looks and pleasant feel of your valuable furniture pieces and let us handle this special task for you. We can provide our customers with top level furniture cleaning at the right price. We strongly advise our customers against the use of homemade, conventional cleaning methods as they will likely result in additional damage and more cleaning and repair costs. Our professional furniture cleaning service is super convenient and excellent value for money. Our cleaners will come equipped and ready for the task at hand. All furniture cleaning is done on site in the comfort of your own home, there will be no need to disassemble or take the furniture to another location. We will dispatch a team of cleaners who will assess the type of fabric or material to be cleaned, determine the level of soiling or damage and choose the most appropriate cleaning method. In most cases, the cleaners might resort to using a combination of a number of different methods in order to achieve the best results without risk of damaging the fabric or material being cleaned. Special considerations such as color fastness and dimensional stability of the fabric are also taken into account by our cleaning technicians. The cleaning systems we use are designed to have an effect only on the material which is to be cleaned and will not damage any other parts of the furniture piece itself, either wood, metal or plastic. The cleaning materials used by the technicians are non-toxic and environmentally friendly.